Exposition en duo avec Nickolay Zhuk, High Gallery, dans le cadre du Warsaw Gallery Weekend, Varsovie, Pologne, 21-23 septembre 2018. 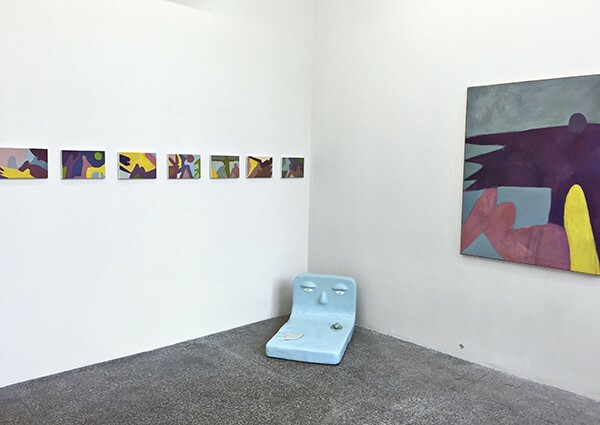 Duo show with Nickolay Zhuk, High Gallery, for Warsaw Gallery Weekend ; Warsaw, Poland, September 21st - 23rd 2018. Exploring the potential of the pictorial medium, Nickolai Zhuk and Louis Gary in the show titled Bugs And Bodies find themselves offering a new sense of the figurative. Influenced by modernism, artists rework historical motifs within personal moments of their intimate experience to utilize and explore their idiosyncratic approach towards the medium. Comprised of sculptures and paintings, the show develops a new sensual experience that leads to an imagery of memories and references, giving us a tendency towards the search for a context, an explanation. It feels as though the works had emerged directly from our unconscious and the show had been suddenly transformed into the place that abides in each of us. Bugs And Bodies addresses the onset of a quite weird mood which is apparently replaced by a conscious, naive positivity. This approach creates an effect that is, eventually, tender, open-hearted, and instant. Through their work, Nickolai and Louis are offering a novel visual experience, in which time and space fuse and the narrative tableaux creates a new, uniquely suggestive atmosphere, enlivened with energy, humour and depth.